I've cruised down quite a few snow-covered hills in my time. In the beginning, my dad and I used a wooden sled with metal runners...until we crashed it into a telephone pole and it shattered into hundreds of pieces, that is. (I can't help but laugh to myself when I think about my mom's response when she looked out the window and saw my dad dragging his two-year-old daughter and destroyed sled back home after such a massive crash. I don't think she let him take me sledding for a couple of years...) For a while we enjoyed a giant wooden toboggan, big enough for four riders at a time, and eventually we transitioned to first metal and then plastic saucers. During my teenage years, inflatable snow tubes became popular and we all learned how gloriously they protected our backsides on the way down the hill. 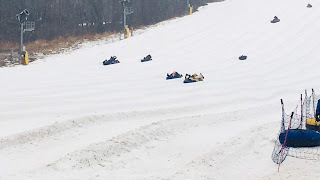 And so now as an adult who has tried a wide variety of sledding options, I can safely say that tubes are the most fun - and least uncomfortable - way to get from point A to point B, when point A is up high and point B is down low and the ground in between the two boasts a healthy layer of snow. Flashback to Will's first - and perhaps most painful - tubing excursion. - The hill was incredibly fast, every time. - The hill was unbelievably smooth, so there was little to no risk of hitting a bump and wiping out. - The surface lift mades getting to the top of the mountain easier for younger/smaller kiddos, and therefore also easier for parents/grown-ups. 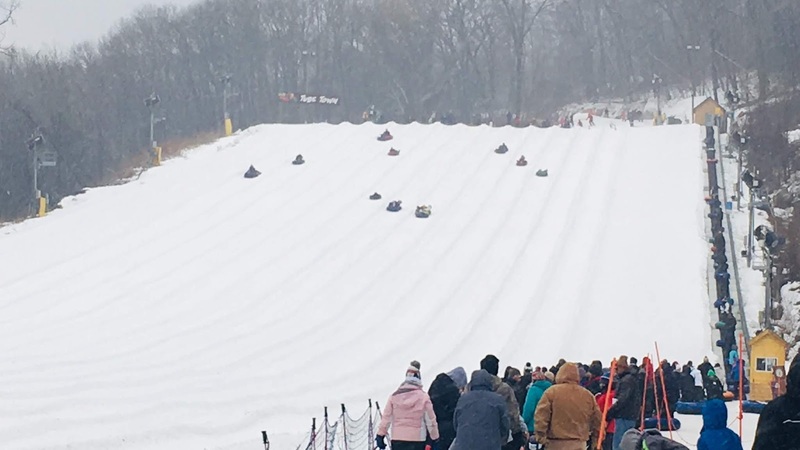 - Cascade has the ability to make its own snow, so if Mother Nature doesn't cooperate (she didn't while we were in Wisconsin this year), you can still tube. - I kind of missed hiking to the top of the mountain - I like the exercise, both for exercise's sake and because it keeps me warmer. - As the line to get onto the surface lift grew longer and longer, it took longer and longer to get to the top of the mountain for our next run. We had to move at their pre-determined pace rather than our own pace, which might have been faster. All in all, tubing in this kind of environment was a blast, and I highly recommend it should you find yourself near Cascade or any other mountain with designated tubing runs. We hope to try out another tubing venue - Nordic Mountain in Wild Rose, Wisconsin - in a couple of years! 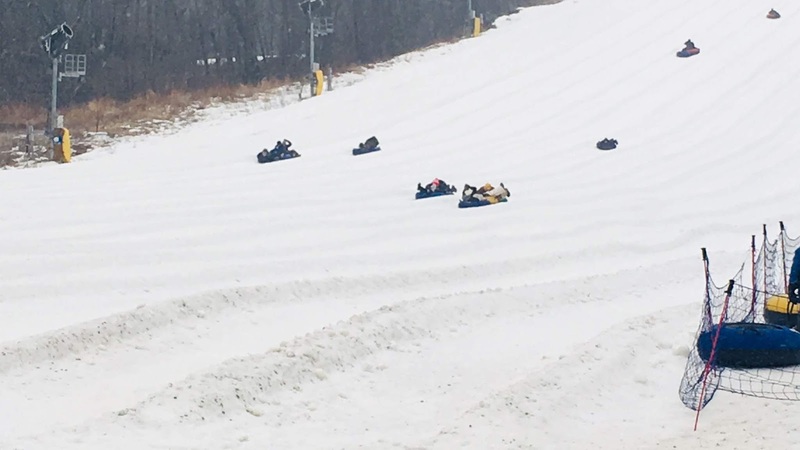 Texas friends, you may have to head a bit north to experience true snow tubing...let me know if you want to go on a road trip!